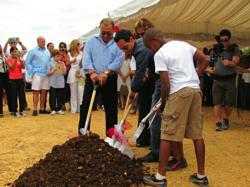 Marc Anthony and Henry Cardenas take part in groundbreaking ceremony. New residence and learning center in Dominican Republic to house over 150 children. Maestro Cares founders Henry Cardenas (left) and Marc Anthony (right) take part today in a groundbreaking ceremony for a new orphanage in the Dominican Republic. International pop icon Marc Anthony and entrepreneur Henry Cardenas took part today in a groundbreaking ceremony for a new residence and learning center for the Dominican orphanage Orfanato Niños de Cristo in La Romana, Dominican Republic. The new complex, which will house over 150 children, is being funded in part by the Maestro Cares Foundation, a non-profit organization launched earlier this year by Anthony and Cardenas. To view photos of the ceremony, visit http://tinyurl.com/cfpdrhg. For more information on Maestro Cares, visit http://www.maestrocares.org. Follow Maestro Cares on Twitter @MaestroCares and Facebook (Facebook.com/Maestro Cares).